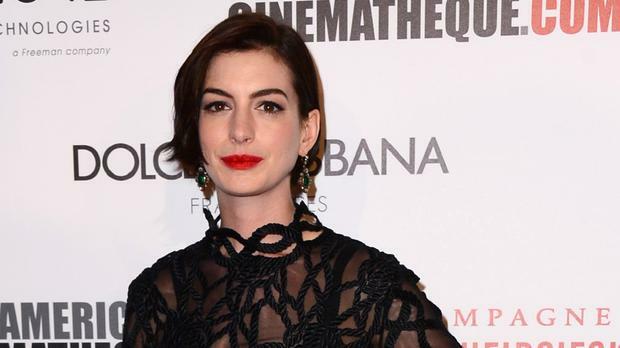 Anne Hathaway has revealed how she almost suffered hypothermia shooting in icy waters for Interstellar. The 31-year-old actress plays an astronaut in Christopher Nolan's new sci-fi epic and one of the scenes was shot on location in freezing water in Iceland, substituting for a foreign planet. Anne told the Hollywood Reporter: "We had tested the suit a few months prior; it was not successfully waterproofed the first time. And when I went under and submerged, the outer suit filled up, and then I was wearing a suit that kayakers wear, called a dry suit. And human error, we didn't close it all the way. And you're in the suit for hours and hours and hours, so there was about an inch opening in it, and I'm sitting in the water, which is not very warm. It filled up to [my shoulders]. "Everybody was cold at that point. We'd been shooting in the elements, and it's not like I was the only one in pain. I was just the only one in specific pain, and I didn't want to hold up shooting. "But at some point, I wasn't sure if I could feel my toes, or they started to tingle, and then I was feeling all sorts of weird flashes and things were getting a little hazy around the edges, and that's when I turned to our first [assistant director], and I said, 'Hey, I don't know that much about hypothermia, but what are the symptoms?' And I explained what was going on, and he said, 'Oh! Like, right now?' And I'm like, 'Yeah!' And so then he went over to Chris, and Chris was like, 'OK - let's roll, let's roll, let's roll right now!' And we were done shortly thereafter." Explaining why he finished filming the scenes, the director added: " There wasn't anywhere to go in the vast expanse of water - vehicles adrift and stuff - so there wasn't any quick solution." The film also stars Matthew McConaughey and Jessica Chastain. Matthew revealed he had fun on his days off while shooting in Canada, driving around through the corn fields with the crops so high you can't see where you're going. He said: "I was living on the property. Not in the house [where his character lives] but in the trailer near the house. I went out when I knew we closed off that production and had a great day! Just not to be able to see, [as] you're doing 85 [mph] through that."